As I continued to cook my way through the America's Test Kitchen Make Ahead cookbook, I decided to make Chicken Tagine. 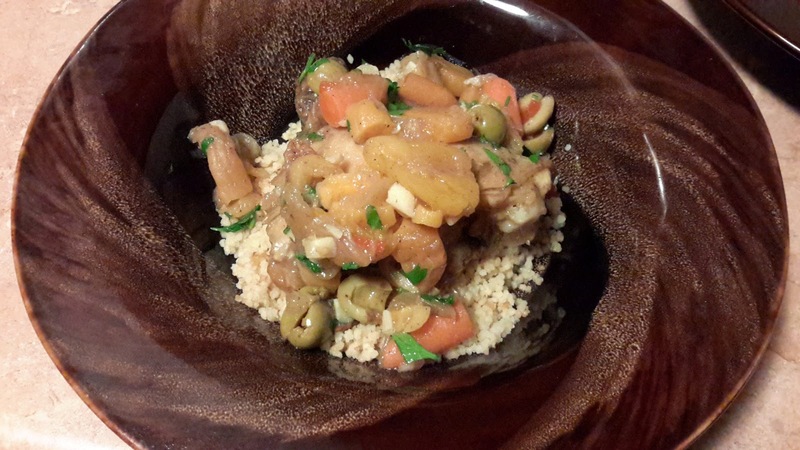 This is a North African dish using chicken thighs, dried apricots, and olives. It's a braised dish, meaning that they meat is first browned, and then simmered in liquid until finished. The dish starts by browning skin-on chicken thighs. The chicken is removed, and onions and other aromatics are browned. A spice mixture is added, which immediately makes the kitchen smell amazing! Broth and the browned chicken are added, along with carrots. The dish is simmered until the chicken reaches 160F. Prior to serving, olives, cilantro, dried apricots, and lemon juice are added. This dish was the first time I have ever tried olives. The flavor of the olives worked well in this dish, but I don't think I would eat them on their own. I served this over couscous, which absorbed the juices from the chicken. The recipe can be found here. Enjoy!